More not-so-great economic numbers: Recession dead ahead? America “going broke slowly”… the eurocrats’ long-term plan… Trump vs. the Deep State, continued… and more! It’s not that the headline is wrong… but it does overlook some problems with the markets and the economy that have nothing to do with war and peace. Recall on Friday while the markets were closed the feds revealed two big blows to the “accelerating economy” narrative. Retail sales disappointed… and inflation suddenly slowed. Turns out that slowing was even more dramatic than we first said: “Core” inflation, excluding food and energy, registered its first monthly decline since January 2010. Homebuilder sentiment: At 68, the housing market index from the National Association of Home Builders is still way above the breakeven line of 50… but it’s less than the “expert consensus” was counting on. Reminder: Both of today’s numbers are “soft data” — sentiment surveys and such. Of late, the soft data’s been much more bullish than the “hard data,” of which we’ll get more tomorrow, including industrial production and housing starts. Meanwhile, projections of first-quarter GDP keep getting revised downward. The latest estimate from the Atlanta Fed — which has a respectable track record in this regard — is a sickly 0.5% annualized rate. “All of these developments are consistent with a recession in the near future,” says Jim Rickards. No guarantees, he cautions — but that’s direction right now. “The current economic expansion is 92 months old,” he reminds us. “The average post-1980 expansion is 80 months. The average post-World War II expansion is about half that. This is one of the longest expansions on record, and historically long by any measure. Expansions don’t die of old age, but they do die. No one should be surprised if this expansion is about to end soon. “Average annual growth during the current expansion is 2.15%. Average annual growth in all post-1980 expansions is 3.19%. That 1% differential may not sound like much, but with the effect of compounding, it’s huge. A 2% economy doubles in 35 years. A 3% economy doubles in 23 years. After about 50 years, the 3% economy will be more than twice as rich as the 2% economy. There’s a multitrillion-dollar output gap being created, which will never be recovered. “Meanwhile, government debt continues to grow at 3% per year, soon to be 4% and higher, according to Congressional Budget Office calculations,” Jim goes on. “What happens when your wealth grows at 2% but your debt grows at 4%? Answer: You go broke. “The bottom line is America is going broke slowly, growing poor slowly, and may be headed into a recession quickly. “Bonds and gold have already figured this out. Bonds are soaring on lower rates in anticipation of a recession. Gold is soaring on a safe-haven bid due to geopolitical uncertainty, and in expectation that inflation is the only way out of the debt problem. Stocks are getting a wake-up call now that Trump’s ‘stimulus’ plans are being deferred or going up in smoke. Despite today’s rally, there’s underlying rot in the stock market — which, we hasten to point out, peaked more than six weeks ago. The “transports” matter in the context of Dow Theory. 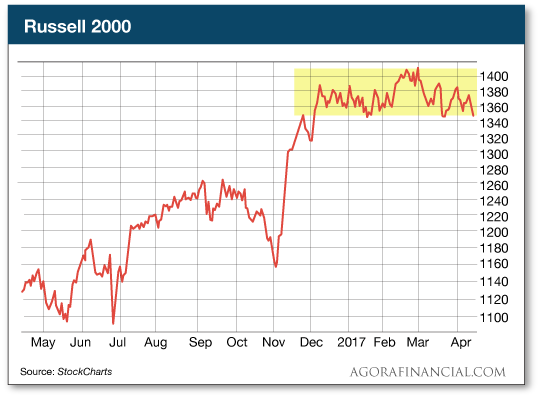 “Dow Theory,” Greg reminds us, “uses two indexes to measure the market’s primary trend: The Dow Jones industrial average and the Dow Jones transportation average. “The idea is that the two groups combined can measure the overall health of the economy. If the industrials are performing well along with the transports, we can assume goods are being made and delivered. In other words, the economy is humming along. But not so in recent days. “The threat of a new cold war with Russia, gridlock in Washington and a new round of earnings reports all have investors on edge,” Zach tells us. 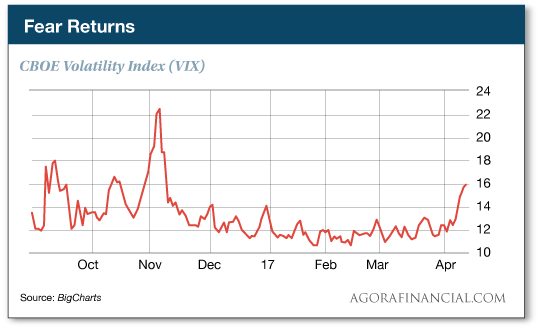 “And that’s why we’re seeing the VIX start to trade higher. Every new subscriber to Zach’s Income on Demand gets a special report describing how to seize on this window of opportunity. If you’re not familiar with Zach’s strategy, here’s a terrific introduction. As a reminder, last November India’s Prime Minister Narendra Modi banned the country’s most commonly used bank notes — about 85% of all cash in circulation. 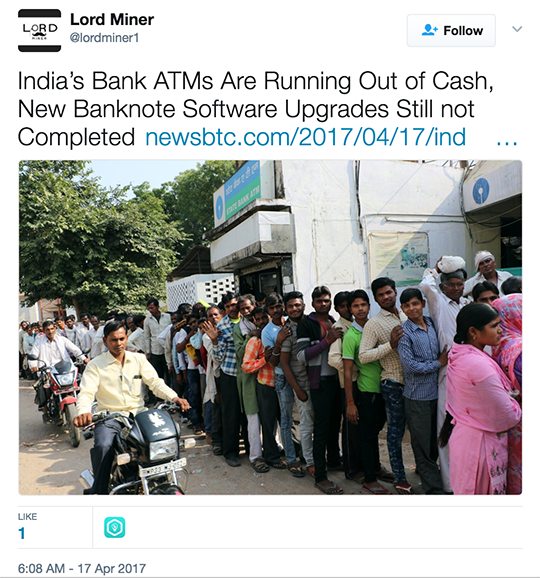 The new bank notes intended to replace them were available only in limited quantities; they were also a new size, so ATMs had to be retrofitted. Long lines and even riots ensued. Modi justified the move as a crackdown on tax evasion on India’s huge, cash-based economy… but he also copped to a long-term plan to push India in the direction of a cashless society. So that’s the context for this latest development. In addition, it appears the shortages are more acute outside the largest state, Uttar Pradesh — where there were local elections in recent weeks, won by Modi’s party. How ’bout that? We never tire of reminding you that India’s cashless scheme was hatched in Washington, D.C., at the U.S. Agency for International Development. As far-fetched as it might seem that the Indian scheme would come to America, we urge you not to dismiss it out of hand. “Love The 5, but the basis for your everlasting belief in the euro as expressed in last Thursday’s edition evades me. You point out that during the Greek crisis polls consistently showed that 60% of the Greek people favored the euro, and backed this up by comparing current inflation in Greece to the days of their own currency prior to the euro. “Of course the Greeks (and the Italians and the Spanish) love the euro: It allows them to export their inflation to the other member countries that use the euro. But it is in the other end of the equation that the problems lie with the euro. Do you really expect Germany, Austria and the other northern EU countries to appreciate the opportunity to accept that inflation and to fork over to the EU the tax risks that go with it? It is the other side of the coin you need to look at, not just at Greece. “You expect that the euro will strengthen in the months ahead as Angela Merkel’s chances for re-election strengthen this fall. Personally, I expect Merkel to be re-elected, but on the grounds of the Germans’ love for physical cash. Merkel’s opposition has stumbled on this in the past when they supported eliminating the 500 euro note. The clash of the titans will be between the German Bundesbank and the European Central Bank. “As the Germans say, ‘Freedom always dies bit by bit,’ and the Bundesbank has taken sides in the war on cash. Consumers in Germany still make about 80% of their transactions using cash, including for large purchases. Figures in Austria are about the same. According to Bloomberg, ‘592 billion of the 1.1 trillion worth of euro bank notes in circulation at the end of 2016 started life at the Bundesbank,’ which I expect far exceeds the allotment set forth by the EU. The 5: Thanks for the insight. Interesting background, for sure. Jim Rickards has long been of the opinion that the euro is not primarily a monetary project, but rather a political one, pressing relentlessly for tighter European integration. The knock on the euro is that the eurozone nations have a unified monetary policy but 19 different fiscal policies; there’s no “federal budget” per se. Jim says that criticism misses the point: “The founders of the euro knew that a unified fiscal policy would be needed, but that was too much too soon to ask of European voters in the 1990s when the Maastricht Treaty on the EU, which led to the creation of the euro, was ratified. “You guys are a riot with that opening line,” a reader writes after last Friday’s 5. “Trump is and has been totally consumed by the Deep State and is now one of their own. “My gut tells me he always was and was only saying the things he said in his campaign to get elected. Not that that makes him any different from every politician this side of Ron Paul. “Sorry, but I do believe that Trump still has you and Jim Rickards bamboozled. I sometimes feel Jim is a little too close to his contacts in the Deep State to be completely objective. The 5: Has the thought occurred to you that elements within the Deep State still wish to remove Trump even though he’s begun doing their bidding? P.S. If, in the course of reading today’s 5, you can’t shake the feeling something bad is about to happen in the markets… one of my distinguished colleagues says you’re absolutely right. What’s more, he says you want to be positioned for what’s coming no later than the end of this week. Click here to see why he’s so concerned.